The National Basketball Association, Turner Sports and NextVR are pushing sports technology, virtual reality, sponsorship and the fan experience to new levels opening night when fans of defending NBA league champions, the Golden State Warriors and everyone else outside located Oracle Arena watching publically at home, work or in a sports bar, have access to a free live stream of the first professional sport game ever broadcast in VR using Samsung Gear VR headset tech. TNT sports tech will change the way fans watch and engage with the 2015-16 NBA season beginning tonight at 10:30 pm ET with the Warriors led by the reigning MVP Stephen Curry playing at home against the New Orleans Pelicans headed by the first pick of the 2012 NBA draft and two-time All-Star, Anthony Davis. The Sports Techie community blog chatted with co-founder David Cole and we are excited to share with our followers and readers the Turner Sports breaking news about this transforming VR system that allows each fan to have their own premium courtside 360-degree seat using high-definition 3-D virtual reality. NBA, Turner Sports And NextVR Pioneer Virtual Reality Video For Fans – SportsTechie blog. The NBA second screen virtual experience begins with the Oculus-powered Gear VR headset equipment from Samsung connected to the NextVR portal located on the Oculus home app. Together with the Turner Sports TNT production at Oracle Arena, fans will enjoy an immersive HD virtual reality viewing of the pre-game championship ring ceremony followed by the riveting live, real-time 3D game broadcast. Cole said five 6K RED active cameras are ready to capture the action tonight. One will be placed at center court as the 180-degree sweet spot for fans, another is directly across from the scorer’s table, while another cam is a high camera that provides an overview, there is a scoreboard view, a cam on one of the baskets, and a mobile camera with perhaps one additional floater cam enabling viewers to choice their camera perspective of choice. 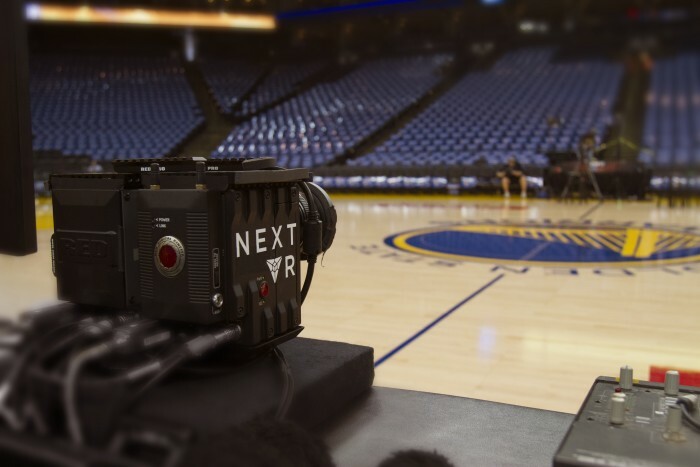 During the 2013-14 NBA season NextVR produced a Warriors and Denver Nuggets game at Oracle Arena. Last season, the NBA were the first U.S. pro sports league to capture the virtual reality experiences for fans by rendering VR and sharing highlights of the NBA All-Star Game and State Farm All-Star Saturday Night from Madison Square Garden in New York city. The 2014-15 All-Star game, 3-point shooting, slam-dunk contest and event practices were captured and delivered in virtual reality. The NBA VR showroom at the annual NBA All-Star Technology Summit showed users the Miami Heat and Cleveland Cavaliers match up in Rio de Janeiro, Brazil was filmed in VR and delivered post-production by NextVR. The NBA wish list of VR features wanted for the future includes next-gen stats, data and analytics, other game highlights and the ability to peruse the NBA store virtually and then order merchandise. Insert the mobile phone into your Gear VR Headset and navigate Oculus Home to download the NextVR experience. You will find the NextVR app featured front and center. Run the NextVR experience and be sure it’s not playing Coldplay. You’re ready to go! The live stream begins at 7:30 p.m. PT. Update the NextVR app if you see NextVR Coldplay experience in Oculus Home. Open Oculus Home on your mobile phone while it is not loaded in the Gear VR headset. Update Oculus Home if you see NextVR Coldplay Experience with no update option. Uninstall NextVR from Android Application Manager on your mobile phone. Swipe down from the top of the screen and then click the “gear” icon to get to settings. Go to Devices->Applications->Application Manager->NextVR-> Uninstall to remove the app. Now re-download the NextVR experience, which should feature the “NBA Live VR” thumbnail in Oculus Home. NextVR base in Laguna Beach is a leading technology company with proprietary technologies that captures and distributes live and on-demand virtual reality experiences allowing the courtside seats experience to be delivered to fans using VR goggles. They are the only business on the planet with the patented capacity to transmit live high definition, three-dimensional virtual reality content over the Internet to headsets for a wireless, life-like and all-encompassing experience for each viewer. The six-year old Orange county company has 36 people, is privately funded and long ago decided to grow with high profile partners such as the Premier League, NHL and NBA that want to build out VR functionality and transmit to end-users. Thus Cole says they are capital intensive or in other words, NextVR is successful at raising capital to support growth as big as they are doing. Cole handles NextVR intellectual properties and technologies. They were founded in 2009 and developed core compression tech for stereoscopic broadcast together with Turner and ESPN. Then in 2012 because of the lagging consumer uptake on 3D television, the company migrated the platform to VR and continues developing their immersive live broadcast platform in stereoscopic 3-D.
Due to the unique approach, their cameras will build a 3D survey, dynamic 3D model of Oracle Arena, bringing a texture map to the world. Cole says the platform delivers computer generated content to real-world video. While inside the video there is depth that is geometrically deep. The user facing value thus becomes a sense of video that generates exact specs and givers a user the sense of actually sitting courtside so when a person turns their head at floor level to see the dynamics of a steal, hear the squeaks of shoes gripping the court or gazes up to see the Jumbotron statistics and replays, is it not just graphics with video but a true VR experience most fans have never experienced before. During last year’s Warriors and Dallas Mavericks game, the Samsung Gear VR Innovator Edition driven by a Galaxy Note 4 and Galaxy S6 phone with Oculus integrated to the Samsung Galaxy smartphone and viewfinder device resulting in a 3-D camera shooting at 60,000 f.p.s. onto the phone screen. The headgear simultaneously transforms the video stream into virtual reality complete with easy to see layers of depth. I asked Cole how long users can comfortably wear a VR headset. He says mostly the weight and cooling of the device are wearable issues with current products. NextVR broadcasted the CNN democratic debate and transmitted via Oculus the keynote address by Facebook founder Mark Zuckerberg both of which are examples of long form in these cases up to 3 hours in length. The average viewer watched all debate speakers using first generation headsets that can be heavy and may fog up. Look for a significant improvement with long form wear for live and archived sporting events such as a World Cup match, Super Bowl game, Indy 500 race or the entire NBA Finals series as new VR gens are released. My next query was in regards to Google cardboard. Cole explained how exposure is good because it’s cheap but since it does not use a strap, it is more “viewmaster and less VR.” Next year, the launch of a new line of flagship smartphones with head tracking from any manufacture will enable an experience as good as google VR according to Cole. I asked about iOS since I use the iPhone and iPad. He says VR right now is a misuse of the iPhone and Apple will need to sanction it before development can be made across iOS devices. The in user portal currently functions with Samsung Gear since Dec 2014 however by the middle of next year, look for other VR outlets such as the Sony PlayStation VR and HTC Vive to give NextVR a significant boost to add to their existing Oculus audience. With 24 patents filed, two granted and one accepted for publish their intellectual property and camera encoder system has immense value. The transmission system has IP because of the high resolution video between 4 and 8 megabytes per second compression. 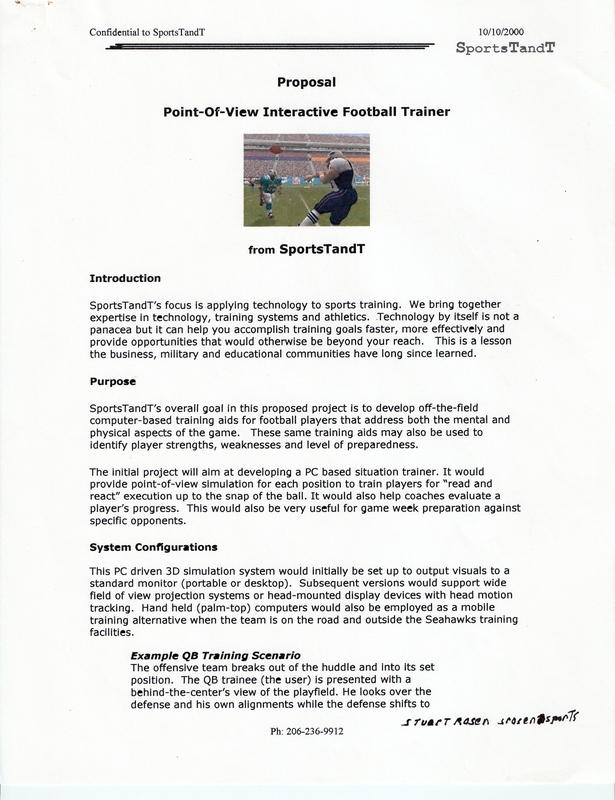 Sports Techie, while I have not yet experienced NextVR I do have work history with these type of solutions dating back to a virtual reality training bid I was involved with together with Wizbang and the Seattle Seahawks back in 1999. Sports Technology and Training Virtual Reality Bid for the Seattle Seahawks. NextVR is targeting the consumer rather than training verticals and earlier this year covered the US Open for Fox Sports One at Chambers Bay in my home state of Washington. They followed golfers around the golf course but the NBA is a different operation so keeping users on center court and dealing with the elements with the other cam positions makes tonight a challenge the company is spring loaded to deliver for Turner. For now the model is free but Cole and other companies are testing models for monetization. Cole feels VR is VR so everything right now is done for the public relations push but there is already a sponsorship component tied to it as well as inertia adverting for further direct monetization. The example of a premium scope makes sense in that if there are 4-5 cameras delivering a VR feed, perhaps the center court cam could act as a premium sponsor purchase. Virtual Reality is indeed a premium experience for fans. Enjoy the NBA Live VR show tonight.